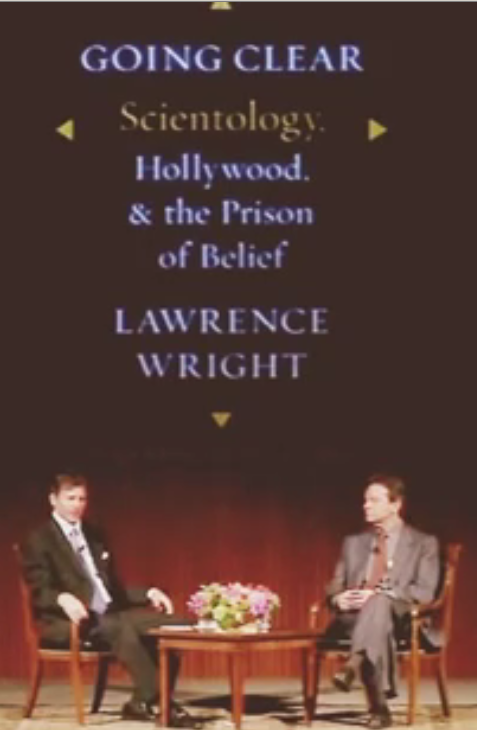 This is an interview with Lawrence Wright which took place at the Texas book Fair in 2014. In it, he discusses his book “Going Clear: Scientology, Hollywood and the Prison of Belief”, which had been published the previous year. “Going Clear” is based on more than 200 interviews with ex-Scientologists and years of archival research and one of a select few texts that has brought the history of the Church of Scientology up to date. Recently, the news broke that HBO, the American premium satellite and cable TV network, is in the final stages of producing a film based on Wright’s book by award-winning documentary film-maker Alex Gibney which they plan to release in 2015. Volney Mathison emerges as a man who was energetic, ingenious, inventive and technically competent. In the 50’s, when science was performing miracles, his impressive-looking e-meters must have lent great credibility to the claims he made for his own “Creative Image Therapy” and for L Ron Hubbard’s “Scientology”. The problem, of course, is that no matter how wonderful his machines were, the theory that they were based on was simply wrong. All that an e-meter can measure is a small decrease in the electrical resistance of the skin. While this often accompanies a state of arousal, knowing this is of little practical use to a psychotherapist. Simply put, ‘arousal’ means that you are stimulated by your environment. You could be having the most profound insight – or thinking about the moment when you stubbed your toe on the way to the doctors office. The wonderful variety of Mathison’s e-meters disguises the fact that their supposed ability to “objectively confirm” what is said by a client to their therapist has no rigorous theoretical foundation at all. The justifications Mathison offered for his e-meter were based on magical thinking – and if that seems harsh, today we will examine a two-page advertisement for another product that Mathison distributed for profit – a “Crystal Pendulum”. In my previous post, we were introduced to the Scientology Org in Berlin, Germany. Today, we are going to take a closer look, courtesy of Fredy Gareis, a journalist who spent no less than five months of 2008 undercover in the Berlin Org – complete with a hidden camera. This may not seem a long time (especially to ex-Scientologists who have spent decades as members of the organisation) but it long enough to reveal the recruitment process and early training and to show the process by which people become trapped in the Scientology mindset. It also reveals the day-to-day reality of Scientology belief and practice – there is a wonderful ‘scene’ when an Org member confidentially assures Gareis that Scientology Auditing can and does cure cancer, and brief footage of a 12 year-old boy being questioned on the e-meter. 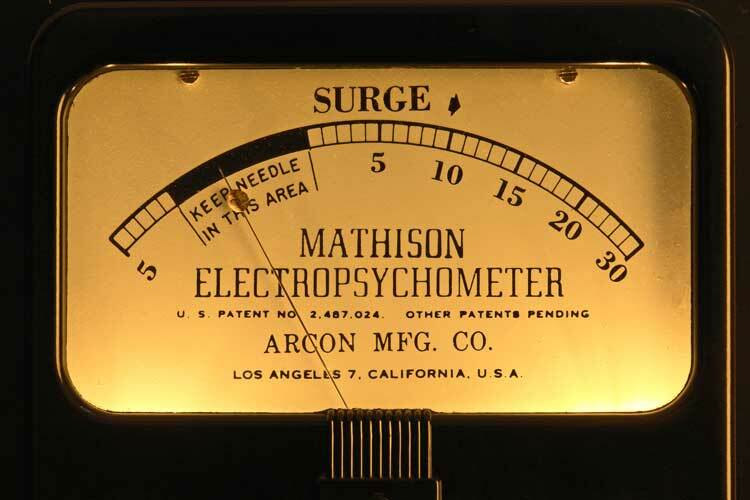 I n his book “Electropsychometry”, (Extract: Read Online | Download as .pdf ) Mathison describes his life after his career at sea, and the genesis of the e-meter. He states that, in 1950, he obtained a patent on a device that helped projectionists regulate the colour of the arc lamps used in cinema projectors – the “Arcon Monitor”. However, his plan to sell these items to cinema owners was frustrated by the advent of television. […] attended a series of lectures being given by a very controversial figure, who several times emphasized that perhaps the major problem of psychotherapy was the difficulty of maintaining the communication of accurate or valid data from the patient to the therapist. The inventor of the e-meter wrote extensively for a wide range of pulp magazines, but preferred to be remembered for his unremarkable contributions to early Science Fiction. His invention is said to have made it’s first appearance in one of those stories, where it functioned as a kind of ‘lie detector’. 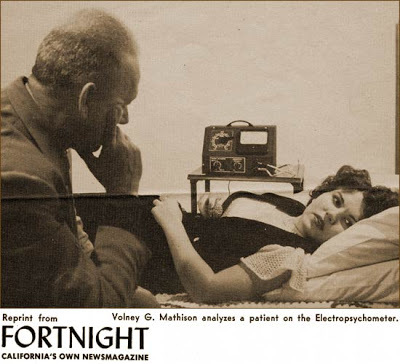 When he originated a pseudo-therapy (which resembled psychoanalysis) he enhanced its credibility with a ‘real’ e-meter. This ‘electropsychometer’ was an electrical device that (he claimed) could indicate mental states.In actual fact, it only measured skin resistance, and functioned only as a pseudo-scientific prop. The inventor promoted his ‘therapy’, and started to sell training and e-meters. At a time when science was starting to transform everyday life it seemed credible that, with the aid of new technology, ordinary people could perform professional services – like psychotherapy – without extensive training. He made regular sales, and his ‘practice’ prospered. The inventor was NOT L Ron Hubbard.